There are two kinds of people in this world: those who use the doggie beach, and those who do not use the doggie beach. A blonde bombshell turned up on our doorstep at 11am yesterday morning: one with four legs. Barley the golden retriever was accompanied by her humans: a family who though unrelated are like family, including Maddie’s fairy godmother. Macaulay was delighted. The two dogs bustled into the back garden to christen the solar lights within earshot of the sea. It was clear the two would need a brisk walk. And though the sandy,flat,golden beach nearest the town is closed to dogs from April to October, yet there is a place – a canine ghetto-beach – where a dog can still sniff the breeze and get the sand between their paws. The no-dogs beach is a vast expanse of golden sand abutting the harbour wall. At low tide you can walk round it, through the harbour gate, to inspect the boats marooned stolidly on the harbour floor. Families spread out and play cricket and football and have picnics and make mini-fortresses with hammer-in windbreaks and rush mats. There is a party atmosphere. But we were off for a bit of doggie purdah, past the Martello Tower and into the rough of the cliffside nature reserve: down the compacted earth steps, many of them, each taking a plunge down a steep slope past mallow flowers and rampaging greenery. We ambled past a black pool of water in which the blonde had her colours done; and at last to the beach. Pretty? In the nose of the beholder, certainly. The doggie beach has its families. Some even camp there for a free holiday, with the odd little limpet-tent hugging the dunes close to the beach. The smell of beach-barbecues hangs companionably in the air along with that seaweed-brine cologne which accompanies a low tide. Ah, low tide. The piquancy of live rock-pool fish and hermit crabs to a dog’s nose; and the charm of dead things. The dogs made a beeline for the thick alienesque seaweed guarding the path to the sea. There were shells and old shoes to be investigated, and an English Channel to drink. They did not mind or heed the great concrete platforms and other old signs that during the war, soldiers embarked here for the short crossing to Mulberry Harbour in Arromanches on the French Coast. They do not specify their beaches should be picturesque, only pungent. Barley was besotted. Her love affair with the salt water knew no bounds. She soused herself in sea: she dunked delightedly. She submerged her nose and closed her eyes in something close to bliss. Macaulay patrolled. He made his camp on a piece of seaweed and glared sternly at the known beached world. He inspected dogs visiting his recently acquired sandy territory. He sniffed and sampled and busied himself doing what neither Napoleon, nor Hitler ever achieved: building a small seaweedy empire on the South Coast of England. And then it was time to leave and deposit the dogs in the house before repairing for a game of cricket to the posh beach. I missed the concrete and the seaweed. And as I sat spectating the match, with its seaside-and-lighthouse backdrop, who should round the harbour wall but the smallest possible dog, accompanying his fisherman owners from their boat, through the harbour gate and across the beach to the town. A dog in transit, true, but a dog on the posh beach. There were no police sirens, and no dog warden appeared. The smallest dog in the world sampled and christened the delights of the sandy beach, unchecked. But I bet the smells weren’t a patch on the doggie beach. Posted in Macaulay The Dog storiesTagged dogs, Folkestone, holiday, humor, humour, pets, seasideBookmark the permalink. We’re being blessed with decent weather, Wanderlust. It’s unheard of! Real blonde bombshell 🙂 Seaweed empire? Count me in! Doggie Paradise written all over them. It does add something, having a dog there, doesn’t it, Myfanwy? It was great 😀 Everyone on both four and two legs had a great time. Thank you! That was a magic carpet ride which took me back to English seaside holidays in the 50’s. I remember having an “aunt” (like Barley’s family) who had a holiday house made of railway carriages, forming 3 sides of a square, with a wooden construction and verandah overlooking the sea. And, there was our dog, a spaniel named “Tigger”. Nice journey, thanks. Ah, the simpler pleasures in life, put to the Macauley sniff test – and with a blond bombshell, no less. Wonderful post, Kate! Master Mac rules his world again, what a lucky guy! King of all he surveys, Lou! I bet you’re fit, though, IE! That climb every day! There is nothing better than watching doggies enjoying themselves in the water. Nothing. You just made my day with this post, Kate. We have a golden retriever too, but she’s more of a redhead. A strawberry blonde 🙂 They have such lovely temperaments. It is pure, unadulterated bliss, Andra. There is nothing as beautiful as dogs enjoying the good life in the water! They know how to be happy, don’t they, Kate? So glad to know that Mac and his pal, Barley, are also enjoying their vacations at the sea, too. They look like they were in their bliss on the doggie beach. You’re a crack shot at capturing Kodak moments Kate. Sounds like this is a trip packed with fun for the entire family. Kind of odd that three big guys had one doughnut hole sized dog. Talk about contrasts. It made me chuckle: I love to see what is usually a trophy dog being allowed to be a classic mutt, tearing around crating miniscule havoc. Barley has a learned teacher in the havoc department with Mac! How wonderful to be a dog and also have beach play and explore time! The photos are just ripe with enjoyment! We saw a doggie beach recently and I so badly wanted to stop and just see the action. You’ve given me the idea that I need to bring my sister-in-law and at least one of her dogs to the spot so I can get in on some action! I know I had my vacation already, but I am greedy when it comes to ocean time. I am thoroughly enjoying your trip with you! Ocean time is very special, isn’t it, Debra? Every time I come here I begin to scheme how I might live here. But; I once lived near the ocean and missed the strangest things: living in a street with other people, the sound of cars on a road outside. Maybe I’ll give it another go in a nice municipal south of England seaside. I find it sad that any beaches need to be restricted. I suppose sheer volume, and the inconsiderate few, make it necessary. If you could see the amount of dog mess down here I think you’d concur with their decision, Col. We are right at the bottom of the socio economic pile here: the dog culture is not a responsible one. All that needs to sort it is enough inspectors poised to pounce on the dog owners who fail to pounce on the poo almost as soon as it has happened. Responsibility would arrive at great speed! I can appreciate there being a No Dogs Allowed beach; irresponsible owners probably made it necessary. How wonderful that there is another beach where the dogs can have their fun. And I’ll bet it’s a lot more fun for for their people, too. It is, PT. We had a blast. 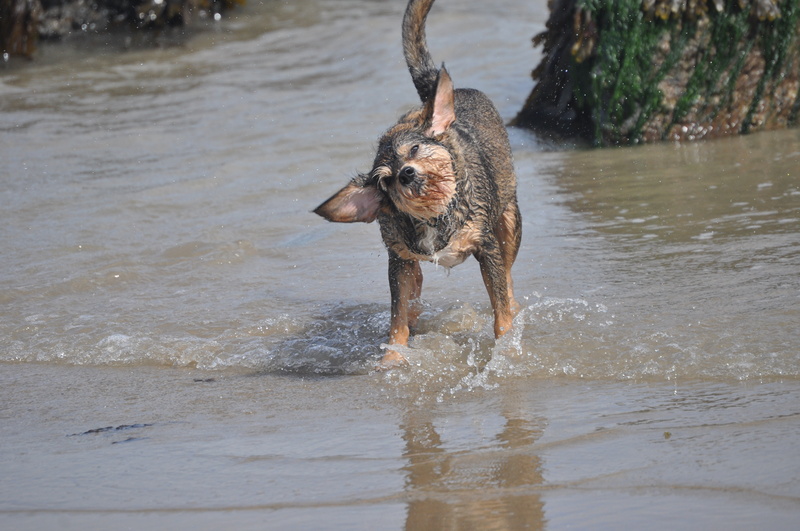 Love the mental images your writing creates … and the photos – especially of the doggy shaking off the water.